Arcane Wonders, known for many great games along with their “Dice Tower Essentials” line of games, recently announced their new bidding, bluffing and betting game that is said to be based on Liar’s Dice system. 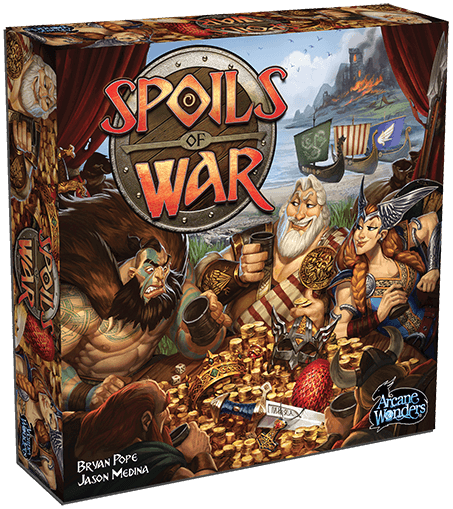 Spoils of War has a similar theme to the famous game Cash n Guns, but here instead of a gangster you are one of the mighty Vikings that are ready to split the spoils from the latest raid. In each round, players will roll dice, bluff and bet to outwit their opponents so they can claim invaluable treasures. The game promises to come with a lot of surprises and twists with high social interaction as the main goal of the design. Attendees of BGG Con had the opportunity to try it and it will hit shelves in April 2017 with a MSRP of $39.99. With the history that Arcane Wonders has, I look forward to this game, as it seems like another extremely fun addition to the genre.